The Factory Cat Model 34 walk behind sweeper is probably the best floor cleaning machine value in the history of sweeper history. The engineer that designed this machine believed that the best design was one that accomplished a goal with the least amount of parts. The result was a machine that is relatively inexpensive to build, effective at its job, and very reliable. In my 20+ years of selling floor cleaning equipment I have never seen a machine that was more loved by our customers! 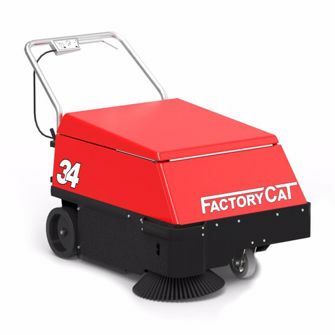 The Factory Cat model 34 sweeps up to 30,000 square feet per hour. That is about 10 times faster than a person can sweep by hand. Labor savings is the number one reason people purchase and lease these sweepers. Companies that sweep regularly typically save at least $300 - $400 per month in reduced labor costs. Besides labor savings, our customers like the Model 34 because it sweeps better than person with a broom ever could. The Main Broom under the machine spins at 300 RPM sweeping up everything from fine dust to heavy objects like chunks of pallets and rocks. It actually leaves a shiny burnished look on many floors. The side broom mounted on the front of the machine, pulls debris from under racks and shelves as well as from expansion joints and cracks in the floor. The side broom is mounted on a shock absorbing bracket allowing operators to sweep close to racks and walls without risking damage to the machine. Many customers don’t realize that effective dust control is probably the most important attribute that any power sweeper must have. Without excellent dust control a sweeper simply makes the fine dust airborne and it eventually settles back on your product, racks, floors, etc. The Factory Cat 34 has a very unique dust control system. A turbine moves a very large volume of air through a “bag house” type filter. These filters can last the life of the machine in many cases. They provide consistent results over the life of the filter. Daily cleaning involves turning a simple agitation bar. Performance is restored to 100% each time you agitate the filter. Other sweepers use disposable paper filters to trap dust; They work well when they are first installed, however, they are difficult to clean thoroughly and the performance of the machine is reduced each day until a new filter is purchased. Clean up to 30,000 ft./hr.